The skin care industry is adept at recommending seemingly endless products to put on our skin, masking the importance of what we eat plays on our appearance. Although nutritional supplements can ensure a consistent intake of nutrients, a healthy diet is irreplaceable in producing the healthiest skin possible. The next time you go grocery shopping, keep the following key foods for great skin in mind. Present in flax seed products, Omega-3s are essential fatty acids which the body needs, but cannot produce on its own. Regular intake will boost and support your skin’s barrier function, heightening its ability to hold moisture and making it appear more plump and fresh. Skin which is durably moisturized from within also appears less wrinkled. Omega-3s have also demonstrated anti-inflammatory effects which can lessen the impact of chronic inflammatory skin disorders such as rosacea and moderate dermatitis. Prescription Vitamin A creams, gels and oral medications are used to reduce excessive skin oiliness, acne and fine wrinkling, however they’re associated with significant side effects such as skin dryness, peeling and increased blood pressure. The Vitamin A found in foods won’t cause these side effects, but they will bring some of the benefits of the Adipex prescription alternatives. Vitamin A is found in higher concentrations in carrots, yellow squash, spinach, paw-paw and mango. Daily sunscreen use and sun avoidance is the main way to prevent photoaging (premature aging of the skin due to light exposure), however these practices also reduce Vitamin D levels, which rise when skin is exposed to sunlight. Vitamin D deficiencies are associated with a range of health concerns from depression to increased incidences of cancer. Although just minutes of sun exposure can be all that are required to boost your Vitamin D levels, if you are at an increased risk of skin cancer even this exposure is best avoided. While you can obtain Vitamin D from a once-a-day supplement, foods fortified with Vitamin D are an option. These include mushrooms exposed to ultraviolet light, eggs and dairy products. Cooking with olive or sunflower oil and snacking on almonds are a great way to improve your Vitamin E intake. Vitamin E is the body’s primary lipid antioxidant. 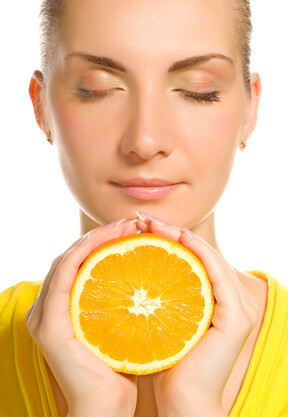 Together with Vitamin C it plays a role in the basic defences of every skin cell. Consuming Vitamin E increases its levels in the skin where it increases moisturization and helps reduce the severity of any sun damage which occurs. Also, visit a great place to learn about essential oils to hear about the benefits for your skin. Sunflower and safflower oils are higher in linoleic acid than olive oil. Cooking with these oils increases your intake of Omega-6 essential fatty acids which are required by the body to function normally, but only available through diet. If you have dry skin, these oils are irreplaceable. They moisturize the skin and strengthen its defences against drying influences such as the environment and facial cleansers. If your skin is prone to sensitivity and redness, as in rosacea, dermatitis or psoriasis, regular dietary sunflower and safflower oil will reduce its environmental reactivity. Omega-6 essential fatty acids are also required for the formation of prostaglandin hormones which initiate and support a range of skin cell functions. If you are on a cholesterol-free diet, a modest intake of sunflower and safflower will reduce the skin dryness often accompanying this type of diet. Skin care products increasingly promote their antioxidant effects, however keep in mind that studies have proven that a combination of both topical and oral antioxidants are more skin-protective than either alone. Berries, pomegranate, green tea and walnuts are excellent sources of antioxidants which benefit the skin by lowering inflammation and the severity of photodamage. Most of the Vitamins found in fresh foods also provide antioxidant benefits. Many spices have strong antioxidant effects, too. Rosemary, cumin, cinnamon, turmeric and oregano have unique antioxidant benefits not found in other foods. If you have rosacea or another inflammatory skin disorder, you will need to know which spices increase your skin’s redness, and stay away from these. Thankfully, chocolate doesn’t cause acne and is a source of antioxidants. Sugar, on the other hand, exacerbates existing acne. Choose dark chocolate, which has far less sugar than regular milk chocolate, and your skin will thank you. Making changes to your diet take time to be reflected in your skin’s appearance. The younger you are, the faster your skin renews and the sooner the visible benefits occur. If you are in your 20s or 30s, allow approximately three months before you see a maximal benefit. If you are over 40, allow four months. For every decade thereafter, allow an extra month. My girlfriend is really into skin care and I have been trying to learn as much as possible to help her and myself. I didn’t know that dark chocolate could be good for skin care. Very refreshing to hear. Thanks for all the great info.